Lahore: Health Department and Punjab Police have launched a joint crack down for elimination of trade of stealing medicine from government hospitals. During raids at various places in Lahore, medicines stolen from Jinnah Hospital worth rupees 40 lakhs were taken into possession and four accused were arrested and case registered. This was disclosed by Khawaja Imran Nazir, Parliamentary Secretary Health and Vice-Chairman Chief Minister Task Force for Elimination of Fake Medicines during a press conference in the office of DG Health, today. He told that on a secret information, Health Department and Lahore Police conducted raids in Johar Town and Tajpura areas and recovered medicines stolen from Jinnah Hospital worth rupees 40 lakhs. The accused Mazhar Ali, Ilyas, Muhammad Jaffer and Muhammad Qaiser involved in the incident have been arrested and cases registered against them at Johar Town and Ghaziabad police stations. 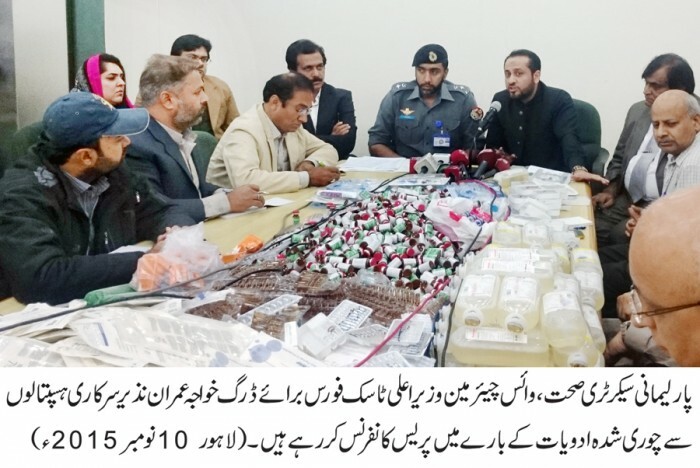 DG Health Dr. Amjad Shehzad, SP City Haroon Joyia, Deputy Secretary Drug Control Dr. Muhammad Ameer, Deputy Drug Controller Shaukat Wahab and concerned Drug Inspectors were present on the occasion. Kh. Imran Nazir further told that on pointing out by the accused, raids were conducted at Lohari Gate and four shops were sealed where more medicines are available and their value will be determined after checking. He said that a massive crackdown has been launched against theft of medicines from the hospitals. He warned that no one involved in this illegal trade will be spared. Kh. Imran Nazir said that Health Management Information System is being introduced with the cooperation of PITB for maintaining government medicines in the province so that complete account of purchase of medicines and their in and out use could be maintained. He said that an operation had been launched against fake medicines a few months ago in which spurious drugs of billions of rupees were taken into possession and cases were registered against hundreds of persons. He said that drug courts have been requested to decide the cases at the earliest for awarding punishment to the accused. He said that business of stealing medicines will be eliminated and provision of medicines to the poor and deserving persons will be ensured.